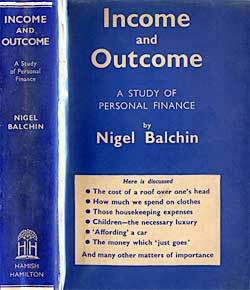 Synopsis: This is a book about personal finance; specifically, Balchin’s aim is to discover where the money in our pockets actually goes and why we always have less of it left at the end of the month than we feel we ought to. The book concludes with forty-two specimen budgets contributed by Balchin’s friends, relatives and acquaintances. See if you can spot which one belongs to the author! Context: Having left the National Institute of Industrial Psychology in 1935, and with a wife and small child to support, Balchin was faced with the need to raise some extra cash. An appeal for funds to his publisher, Hamish Hamilton, resulted in the idea for this book, but not before Hamilton had rejected several other suggestions made by the author. This was the final Balchin book to appear under the Hamish Hamilton imprint: he originally signed a six-book contract with the firm but discharged his obligation within a mere two years! Verdict: Don’t be put off by the seemingly dry subject matter: this is arguably the most purely enjoyable of all Balchin’s non-fiction books. It is packed with commonsense but Balchin dispenses his advice with a light touch and the book is gently amusing and consistently readable. Moreover, many of the author’s arguments are as valid today as when they were first advanced eighty years ago. Availability: Very difficult (but not totally impossible) to find.